I absolutely love this time of year, the days are longer and everything in nature is changing with a growing promise of new life. Yes, spring has officially sprung and my family and I can’t get enough of the outdoors. On the weekends you can often find us at our local park with my husband attempting to learn the unicycle and my two boys making friends with the neighborhood kids. Sunscreen is a must have item to keep my family safe in the sun. I always carry a bottle around in my handbag for when we need to reapply throughout the day, ensuring we all stay protected. 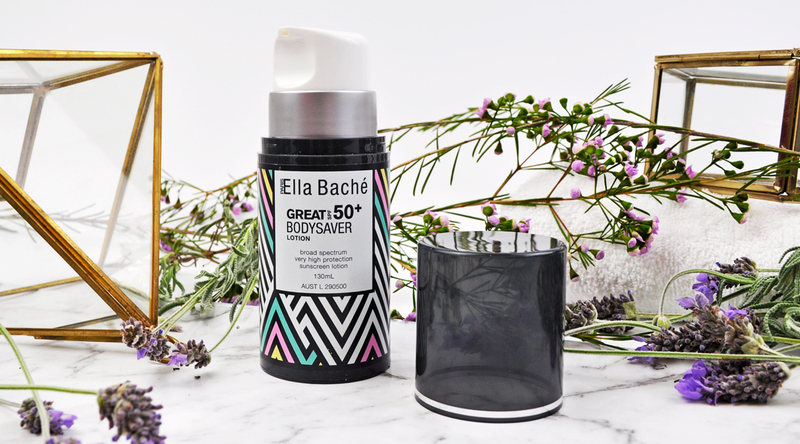 Ella Bachés Great Bodysaver Lotion SPF 50+ is the latest addition to my skin care arsenal. With a 4 hour water resistant protection, it has been specifically designed for use during water sports or outdoor activities. Formulated with lanolin, macadamia nut, and olive oil derivates to keep skin soft, moisturised and hydrated. Packed with super fruit antioxidant complex of pomegranate, cranberry, grape seed and vitamin E, it enhances the skins’ protective barrier and prevents moisture loss. Superfruit Antioxidants pomegranate, cranberry, grape seed oils and green tea to protect cells from UV induced free radicals. Squalene from olive oil to moisturise and reinforce the lipid barrier. Macadamia nut oil for skin moisturising and softening. Lanolin to protect skin and prevent moisture loss. Organic UV absorbers of UVA and UVB rays to prevent premature aging. I find the light non-sticky formula to be the perfect base under makeup. It sinks into my skin quickly leaving it soft and hydrated. Best of all it protects against UV rays and skin cancer as well as keeping my skin looking younger by preventing wrinkles and dark spots. You can use it on both your face and body and it’s ideal for all skin types and conditions. How to use: Apply generously to sun exposed areas, 20 minutes before sun exposure and reapply often, especially after swimming, towel drying or excessive perspiration. Ella Baché is launching some exciting new products – 24th SeptemberElla Baché’s NEW Great Bodysaver Lotion SPF 50+ is a nourishing and fast absorbing light weight non-greasy lotion for the face and body offering the highest broad spectrum protection of SPF 50+. The perfect take everywhere product for Summer, Great Bodysaver Lotion works hard to protect your skin from harmful rays whilst also providing your skin with nourishing benefits. Great Bodysaver Lotion is enriched with lanolin, macadamia nut and olive oil derivates to keep skin soft, moisturised and hydrated. Packed with super fruit antioxidant complex of pomegranate, cranberry, grape seed and vitamin E, it enhances the skins’ protective barrier and prevents moisture loss. For me, I am a lot less self-critical now than when I was younger. Every day I try and live a positive life which leaves me feeling confident in my own skin. My motto is; be grateful, do what makes you happy, believe in yourself and the rest will follow. Price (AUD) Ella Baché Great Bodysaver Lotion SPF 50+ | 130mls | RRP $49.00 – Available at all Ella Bache salons, David Jones stores and the Ella Baché online store from the 24th September | Visit https://www.ellabache.com.au to find your nearest stockist. What empowers you to find confidence in your own skin? Oh this sounds so lovely, I haven’t used much Ella Bache before, might have to check this out. I have not come across this brand yet but you made me want to try em! The packaging is sooo pretty! I want to try out this product! I don’t think I’ve ever used an Ella Bache product, but I really love the packaging on this body saver lotion. Sounds great! Love SPF products that are packed with other skin benefiting indregients!! I’ve never tried any products from Ella Bache, But I am loving the packaging of this SPF! This sounds great! Conventional sunscreens often drive my skin crazy! I love finding a new sunscreen! And the packaging on this one is super cute too. Will definitely keep it in mind next time I’m on the hunt! This formula sounds amazing, I love the powerful superfood ingredients!